I would have preferred the German tank riders to be holding their weapons at the ready position, in case they need to fire them. Same goes for their halftrack crews – would like to see some pointing and aiming/firing their rifles, and MGs. The Russians are the only ones who look ready for action. I think the Germans and Americans are riding on the tank, not tank riders. They would be jumping of the tank before going into action. Fred you would not knowingly go anywhere near the enemy with a grunt sitting astride your main armament! I like the figures. As has been pointed out, you would dismount before nearing the enemy. This is an expedient. Being anywhere near a tank when it fires will cause overpressure that can stun, incapacitate, or kill you. The pressure wave can also hurt the crew inside the vehicle! Exactly. All too relaxed. Looks like a road march not anywhere close to combat. Good Grief Charlie Brown! Why is this your only comment ever regardless of whether people love, hate or correct your posts??? Why don't you say something original for a change my friend! (smile) (wink) (deleted) … Cheers! "As has been pointed out, you would dismount before nearing the enemy". There are accounts of Germans in Normandy riding into battle on Panthers, and I suspect other armor as well, for night-time attacks, to take or recapture small villages and towns. 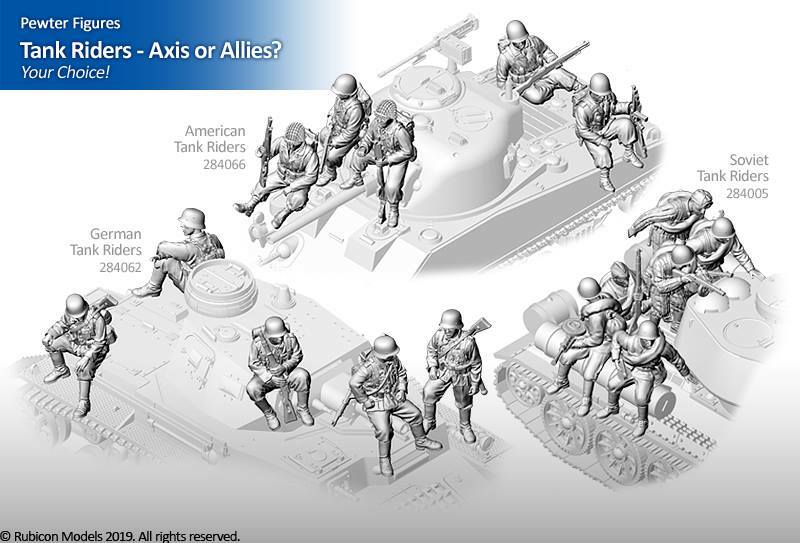 Presumably, they would be more keen to be ready to do battle/protect themselves than the guys casually riding on the tanks, as shown above. Note, for all my complaints/suggestions, I'd like to put them into perspective. At least it is good to see Rubicon producing tank riders in any pose, since many companies haven't. I suspect many will be used for creating small dioramas, since their figures look quite nice. I do hope they will consider producing more in the future, especially in more active/alert poses, like those produced for the Soviets. I agree, they are nice figures. I was also thinking many of them would be useful in trucks and for other purposes besides riding tanks. I have wanted something like this for a long time. I prefer action or at the ready poses but I'm glad to have these all the same.